Primates are among the most threatened taxa of mammals in the world. Tracking the status of primates requires continually assessing population distribution, abundance, and threats, which in turn requires the extent of a species’ occurrence to be known. Defining this important parameter in practice can be difficult. 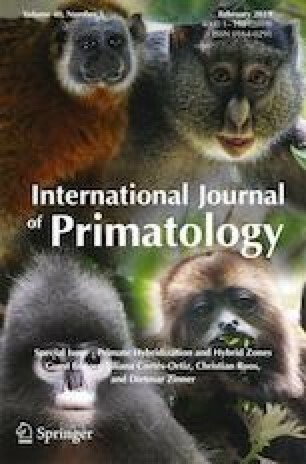 In this article we demonstrate how camera traps can be used to address this with a case study involving two macaque species on the northernmost peninsula of Sulawesi, Indonesia. We deployed 83 camera traps across the suspected interface between the Critically Endangered Macaca nigra and the Vulnerable Macaca nigrescens. Using spatially explicit photographic records of both species, we found the boundary between the two species is 14.85 km farther west than previously defined. We estimate that the additional area encompassed by this new boundary location equates to 224 km2 of suitable habitat for M. nigra, an increase of 7.5%. This has important implications for more accurately assessing the threatened status of both species in the future. As camera traps become cheaper, their deployment at broader spatial scales is becoming more feasible, which in turn provides opportunities to enhance our ecological understanding of species. Here, we demonstrate an additional insight that can be gained from such technology, by showing how the range extent of a Critically Endangered primate can be accurately demarcated. Accordingly, we encourage primatologists to think more broadly about the possible applications of camera traps and to include them as tools in their conservation inventories. Handling Editor: Joanna M. Setchell. We express our gratitude and thanks to the Ministry of Science and Technology (RISTEK) for permission to conduct this research in Indonesia. We also acknowledge, with thanks, the permission granted by the Bogani Nani Wartabone National Park management authority, in particular Pak Awang Lukita, and BKSDA North Sulawesi, in particular Pak Yakub Ambagau, for support of our research. We are indebted to our field assistants: Nicodemus Malir, Hanisa Silayar, Fandy Pongantung, Adha Yakseb, Omega Judistira, Idham Pohi, Muhamad Ihwan, Sukrisno, and Luciano Gawina for their hard work. Funding was provided by the Global Environmental Facility, as administered through the project Enhancing the Protected Area System of Sulawesi, Wildlife Reserves Singapore Conservation Fund, and Fondation Segré. We are also grateful to Joanna Setchell and an anonymous reviewer for useful comments that helped greatly improve the manuscript.